Tired of using automotive headlights to load your power supply? Not a good idea, because the initial load is near zero ohms, which may trip your over-current protector. There is a better way, even if you are now using large power resistors for the job. This circuit uses transistors to gently increase the load from nothing to the full dissipation capability of the transistors - in this case 2N3055's. In its present form, the circuit is capable of cranking up to 30+ amperes load. Add another 2N3055 and 1-ohm resistor and you can test a 50+-amp supply. Junk box parts will work just fine. Use # 10 wire (We use speaker wire) to hook to your power supply. Observe polarity. With the Toggle switch in the low current position, turn on your power supply. The meters should show 12+ volts and tiny current draw. Advance the pot slowly while observing the ammeter. Max current in low range will be about 10 amps. If all is well, back off the pot and switch to high range. 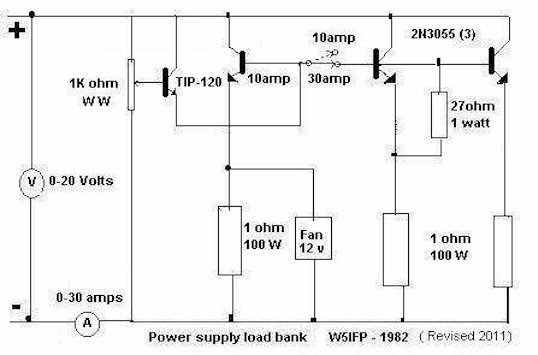 Load to rating of your power supply. If all's well, back off the pot to the continuous duty rating of the supply (17 amp for an Astron RS-20). Let it cook for a while. When the power supply heat sink is hot, shut off the AC and immediately turn it back on. The power supply must not stumble, but immediately restore the rated continuous duty current and voltage. Repeat this test several times. Remove power, take a break while things cool, return and turn the supply on. Again, no stumble and no shutdown. With this simple tool, you will be able to check your power supplies such that failure at a remote site can be much less likely. Parts aging in an old supply can be detected such that early replacement may prevent inconvenient failure. Assemble the unit with lots of space for airflow. Use #10 wire for the 12-vdc lines #18 for the emitter switching circuitry. Set up the fan to blow on the Heat sink and 1-ohm resistors. Mounting the unit in a case with perforated covers will protect the components and insure good airflow. Telcon, Tech Service, Astron Corp, 9/09.